eReader1: Is there an Easy Way to Stop Smoking? Is there an Easy Way to Stop Smoking? 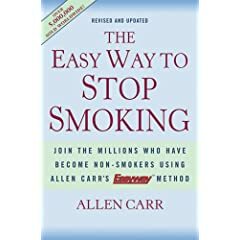 My husband & I recently put ourselves through the Allen Carr Easy Way to Stop Smoking program - probably one of the most celebrated & successful smoking cessation methods out there. Reviews on numerous websites for the past 20 years are always overwhelmingly positive & Allen's clinics are all over the world. Although only available in UK as a Kindle edition, this book has had such a major impact on my life, that it's one that I have to review. EasyWay to Stop Smoking comes in various formats - a narrated CD & audio version (downloadable to Kindle), Kindle edition (for UK only at the moment) & online webcasts for numerous countries. I confess, I've owned an older UK edition of this book for maybe 8 or 10 years. Being a 20+ a day smoker for 18 years, I wanted to stop but couldn't. I would read a bit of the book then stop. For months. Read a bit then stop. I tried reading it with my husband but since he doesn't like reading all that much & I don't like reading out loud all that much, we delayed again for another couple of years. I'd tried so many methods to quit - gum, patches, hypnotism etc etc, I spent the last 2 years utterly depressed at the idea of smoking every single day for the rest of my life. A few weeks ago, I decided to try again and to drag my husband along with me. I bought him the CD to listen to (UK version), but with so many British references etc, and the documentary-style commentary, he didn't enjoy that so much either, so ultimately he ended up plumping for the $149 webcast seminar for the American audience. By the time he logged in, I'd read the book & I was already 24 hours smoke free. Repeat...... I'd read the book & I was already 24 hours smoke free. He watched & I listened. By the time it was over, my husband was bouncing in his seat, ready to quit. And I was a 100% confirmed non-smoker. I never - EVER - wanted to smoke again. And now, I still don't want to smoke again. If someone walked in here right now and offered me $50k to smoke a cigarette, I wouldn't do it. Because I know I'd been signing back on to smoke all day, every day, for the rest of my life. Don't get me wrong - Easy Way isn't a magic spell that suddenly stops all urge to smoke. That addiction still exists, but the way I view the drug is entirely different! I can see myself from the outside - in the eyes of a non smoker. I realize I don't need it, and that those urges are nothing more than my sub-conscious mind playing Pavlovian tricks on me, telling me it's time to light up, telling me this movie would be more fun with a cigarette, this coffee would taste better. All BS, of course. And I know it. Some days I have to repeat that a few more times than other days - my mind gets sneaky & tries to throw out an image of me smoking after dinner, but I know them for the tactics they are! That monster can't fool me! The freaky thing is how strange my body has been feeling. And it makes me realize how much smoking effected my body: Since the day I became a non-smoker, I've been bit light headed, giddy. One day I felt almost drunk and was useless at work. I don't even drink! That's oxygen! For days, my lips, face & hands have been tingling. Apparently that's nerve endings regrowing! Little areas on my toes that have been completely numb for years - they have pins and needles! Lights seem brighter. And I can SMELL things that I didn't realize had a smell before. And ugh! My office stinks of stale smoke. I'm tasting more - and frankly, Diet Coke isn't nearly as good as I thought it was! It's actually pretty gross. But that's a good thing too because I've been addicted to that nasty drink for even longer than I was a smoker! Allen Carr says in his book that I would ENJOY being a non smoker. I'll be honest, I do get the odd craving. But it feels so good to be a non smoker for the first time in over 18 years, that I don't care about the cravings. I am so amazed at the changes that I can FEEL happening to me, that when a craving happens, I can gloat that the little monster inside of me is dying, and will soon be no more than a little ghost. I can take a breath and imagine that monster shriveling up and dying. It's not a magic book but it is an awakening. A way to help you step back and see cigarettes for what they really are, to understand them and yourself as a smoker, and yourself as a non smoker. In all my previous attempts - patches, gum etc - I was always miserable, feeling deprived, hysterical & panicky, but this way, I feel great. I feel in control (albeit woozy and light headed from all that oxygen!!) & for the first time in my adult life, I am a non smoker. For those who want to quit.... read the book. Or at least read the reviews on Amazon! An average 5 star rating, over 500 reviews - just for one edition. Other editions have the same 5 stars from hundreds of readers. I think it would be the most important and precious gift you could give to yourself! Finished the book but must have missed something. Found myself thinking far too much about smoking and realized I was still working on the Will Power method. Thanks to your posts here, I'm re-reading the book with a new-found sense that I'm going to get it right and kill both the little and the big monsters. . . Thank you for your posts and candor. I am still a non-smoker 2 1/2 years later. I can't believe I smoked over 150,000 cigarettes in my life. 5 months after writing that review, I hit a major tragedy in my life, with two family members being murdered. If ANYTHING was going to turn me back to smoking, that would have been it. But this book gave me such a foundation as a non-smoker (not an ex-smoker but literally took my mind back to my pre-smoking mindset) that I didn't need a cigarette as a crutch - the only time I thought about a cigarette was with the realization that if I were still a smoker, I would have been chaining my way through the tough days. Be prepared for that monster! It will try to get you when you least expect it but with the right armor, you can kill it!